The Baixo Vouga Lagunar (BVL) is part of Ria de Aveiro coastal lagoon in Portugal, which is classified as a Special Protection Area under the European Habitats and Birds Directives. This part of the system, corresponding to the confluence of the Vouga River with the lagoon, is very important culturally and socioeconomically for the local communities, taking place several human activities, especially agriculture. To prevent salt water intrusion from the Ria de Aveiro into agriculture fields, a floodbank was initiated in the 90’s. In frame of ongoing changes in Ria de Aveiro hydrodynamics, the existing floodbank will be now extended, introducing further changes in the ecological dynamics of the BVL and its adjacent area. As a consequence, the water level in the floodbank downstream side is expected to rise, increasing the submersion period in tidal wetlands, and leading to coastal squeeze. The aim of this study is to apply an ecosystem based-management approach to mitigate the impacts on biodiversity resulting from the management plan. 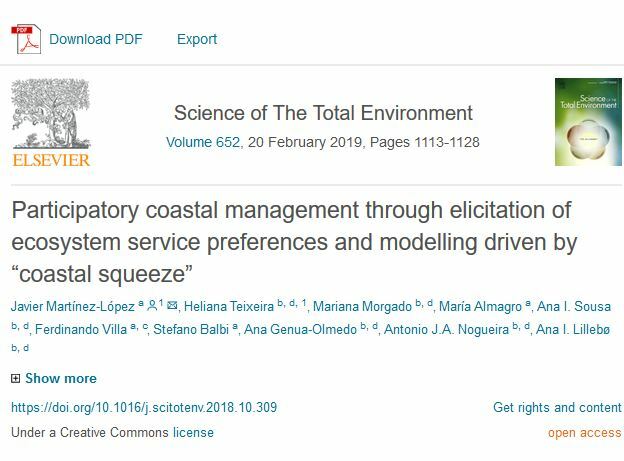 To do so, we have modelled the implications of the changes in several hydrological and environmental variables on four saltmarsh species and habitats distribution, as well as on their associated ecosystem services, both upstream and downstream of the floodbank. The ecosystem services of interest were prioritized by stakeholders’ elicitation, which were then used as an input to a spatial multi-criteria analysis aimed to find the best management actions to compensate for the unintended loss of biodiversity and ecosystem services in the BVL. According to our results, the main areas to be preserved in the BVL were the traditional agricultural mosaic fields; the freshwater courses and the subtidal estuarine channels. 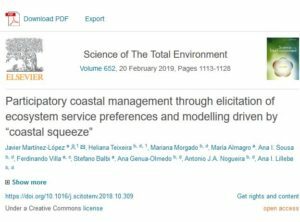 By combining ecology with the analysis of social preferences, this study shows how co-developed solutions can support adaptive management and the conservation of coastal ecosystems.